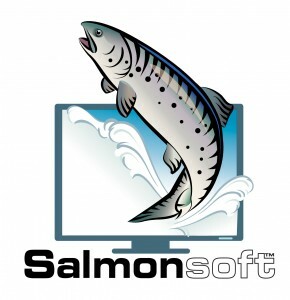 Salmonsoft, formed in 1998, develops software to improve the process of counting fish at dams, weirs, and fishwheels. Salmonsoft is the creator of FishTick, a computerized video system that simplifies the process of estimating fish passage at fish viewing stations at dams and weirs. FishTick greatly improves the fish-counting procedure, making it easier, more accurate, and faster, saving you 50% - 70% of your time. Click below for even more reasons why you should use FishTick. FishTick is currently being used by the Michigan Department of Natural Resources, United States Fish and Wildlife Service (USFWS) in Alaska, United States Forest Service in Southeast Alaska (USFS), Eugene Water and Electric Board in Oregon, and United States Fish and Wildlife Service at a weir on the Pere Marquette River in Michigan, and it is used to count fish at all Connecticut Basin dams where fish are counted. FishTick is also being used in Italy and Wales, and EAWAG is using the software at the Reuss River in Switzerland. The photo at the right is the Pere Marquette fish ladder in Michigan. 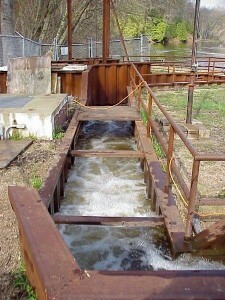 FishTick combines video and computer technology to simplify the task of counting fish at dams and weirs. Anyone who has sat at a fish viewing window at a dam, or in front of a monitor reviewing tapes of fish passage, knows that counting fish can be a very tedious job. Often there is hour after hour of no fish passage, greatly increasing the possibility of those rare fish passing being missed. FishTick presents to the reviewer those images likely to contain passing fish. The reviewer can quickly scan through the images of possible fish passage, selecting the species. The information is automatically categorized by date, time, and species, and placed in the appropriate position in a Microsoft Excel spreadsheet. Anyone who is trying to count fish at a dam or weir where video equipment can be installed to monitor fish passage. FishTick greatly reduces the amount of video that must be reviewed and provides an interface where fish counts are placed directly into a customizable Excel spreadsheet, decreasing the time required for data entry and eliminating the possibility of errors in transcribing data. FishTick also allows managers to subsample the times in which fish are counted if it is not necessary to record every fish. FishTick can also be set to record the time of passage for every fish, making it easy to develop subsampling schemes. Finally, FishTick can incorporate temperature and PIT tag codes into the video record. Fish Tick consists of two components: a video capture program and a video review program. The video capture program takes video images of fish passage, either as recorded on site, or from those recorded on video tape or video (AVI) file, and determines whether fish are present. Fish images are stored as a video file on a hard drive, removable hard drive, or flash drive. Also stored in the video file is information on the time of fish passage. The user has the option of recording all video frames, while only reviewing those frames with fish passage. The ability to subsample by only recording during certain times is also included. The video review program allows the user to quickly scan through the video file, using the mouse or keyboard to tally species. The ability to subsample, by only looking at portions of the file, is also included. Fish counts are stored in an Excel spreadsheet organized by date and time.